The Prius+ has an extended roofline with an integral, panoramic sunroof. FRANKFURT -- Toyota Motor Corp. will debut the Prius+, a seven-seat version of its Prius hybrid car, at the Frankfurt auto show next month, ahead of European sales beginning in the first half of 2012. Designed to extend the appeal of the Prius range to families and those needing more space, the Prius+ offers a three-row seating format. The car is 155mm longer, 30mm wider and 85mm taller than the third-generation Prius hatchback, from which it is derived. The wheelbase has been extended by 80mm. Toyota said that the seven-seat configuration will provide 200 liters of cargo space, rising to 535 liters when the third row of seating is stowed away. Adding additional seating has been made possible by the use of a new compact lithium ion battery pack, which is stored between the front seats within the center console. The Prius+ has a 1.8-liter gasoline engine and an electric motor and is the first non-plug-in Toyota full hybrid to use a new compact lithium ion battery. Previous Toyota hybrids have used nickel-metal hydride batteries. The seven-seat Prius+ will appeal to families. 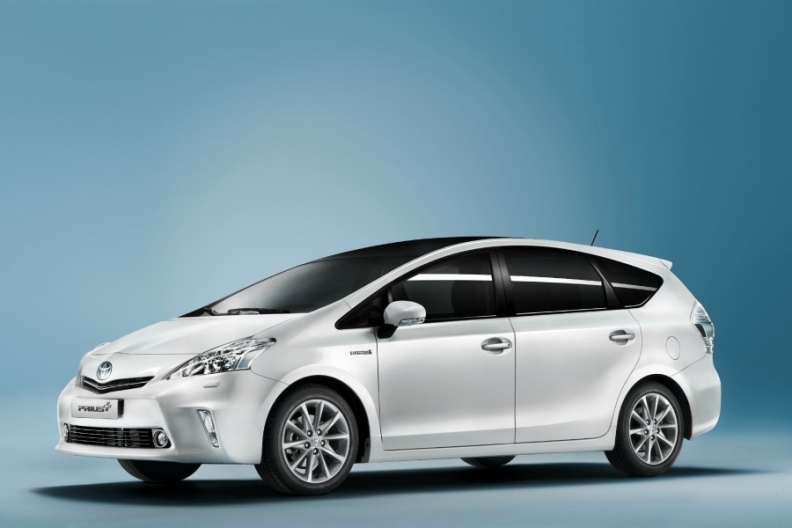 The Prius+ will join an expanded Toyota hybrid range in Europe that will include the Auris hybrid, the new plug-in hybrid Prius and the Yaris hybrid.